August 24, 2018, 8 a.m.
Current Situation: Scattered thunderstorms over the last two days brought rain and increased humidity to the fire area. 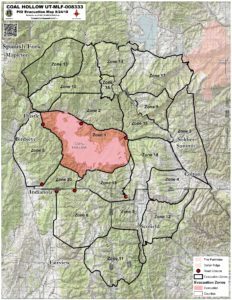 Several debris flows occurred on the fire, making access to the area a challenge. Concerns stemming from excess moisture in recently burned areas make work in some areas more difficult than in others. Crews continued to tie together completed fire lines to increase containment to 80 percent. On the east and south sides of the fire, in Divisions Q, R, T, and X, crews will work on suppression repair and removing equipment. Crews in Division X will continue working on indirect hand line to tie lines together. Around the remainder of the fire perimeter in the west and north—Divisions Z, J, and M—firefighters are removing equipment and working on rehabilitation and repair of areas impacted by fire suppression efforts. 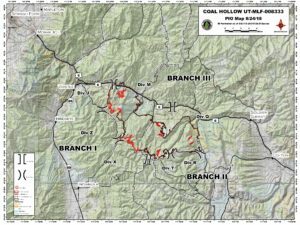 Today is the last day for the Rocky Mountain Type 1 Incident Management Team’s work on the Coal Hollow Fire. The team will return home to prepare for its next assignment. The team wishes to thank all our partners and the support of the local community. The Northern Rockies Type 2 Incident Management Team 6 arrived Thursday evening. The team will shadow operations today and will take over management of the Coal Hollow Fire tonight at 8 p.m. Weather: Slight chances of rain showers and thunderstorms are possible Friday afternoon, but rain amounts are not expected to exceed 0.15 inch. Winds are expected to increase Sunday into Monday. A chance of showers and thunderstorms will return Monday.